I know it isn’t even Thanksgiving yet but I can’t help but get into the Christmas mood when I walk into a store and they have Christmas music playing, Christmas displays on every end cap and even the Christmas candy is right there starring me down. I was THIS close to buying a bag of candy cane kisses yesterday. 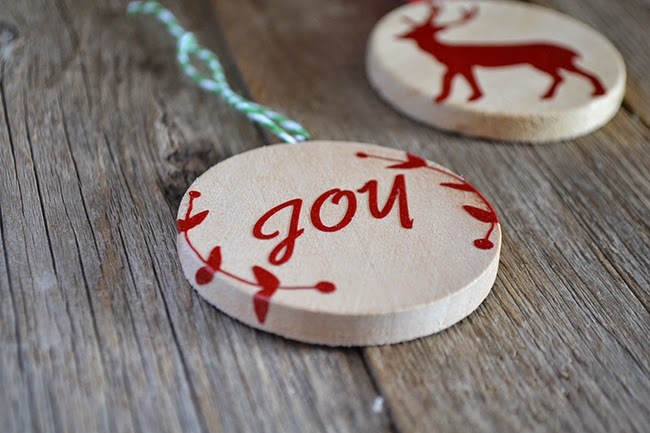 I am joining with a bunch of other bloggers to bring you a whole lotta handmade ornament ideas. 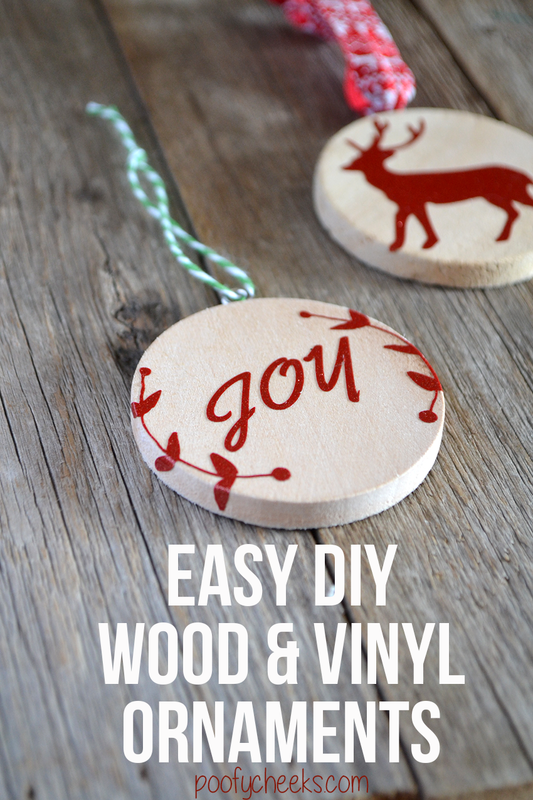 I am going to show you how I made these super easy wood slice ornaments. When we moved I got rid of a lot of holiday décor including all of the cheap Christmas balls Mike and I had bought during our first Christmas together. I am going to need to make quite a few ornaments to make up for the ones I tossed and donated. The wood slice and vinyl ornaments I made are probably one of the easiest things I have ever made. I used my Silhouette Cameo to cut out glitter vinyl shapes and then used vinyl transfer paper to apply them to wooden circle discs. I twisted in screw hooks and used twine and printed ribbon to make ornament hangers. The hardest part was twisting in the screw hooks – the first few were easy but some weren’t so easy so I enlisted the help of a pair of pliers. 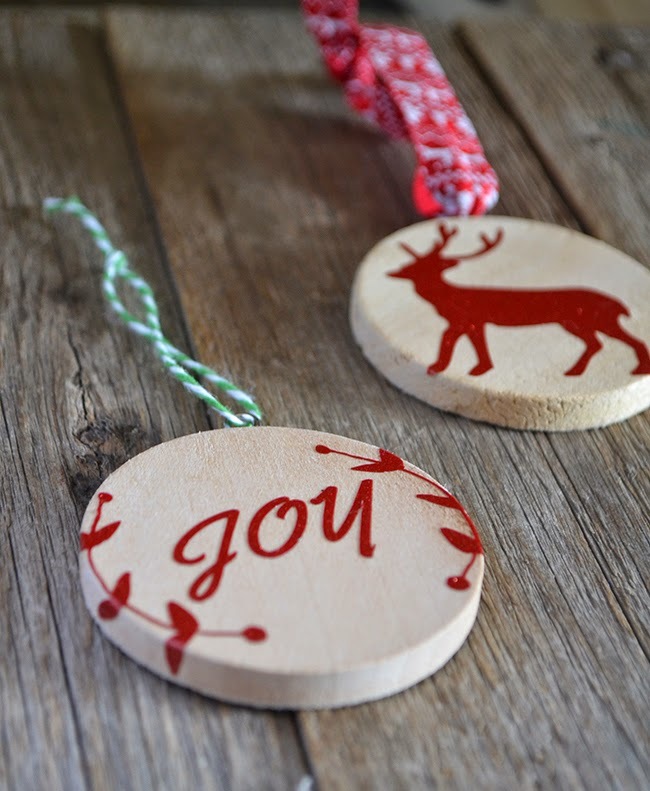 You could make dozens of these in no time – they are going to look perfect on my rustic Christmas tree this year! If you are in the handmade ornament mood take a look at what my blogging friends made! 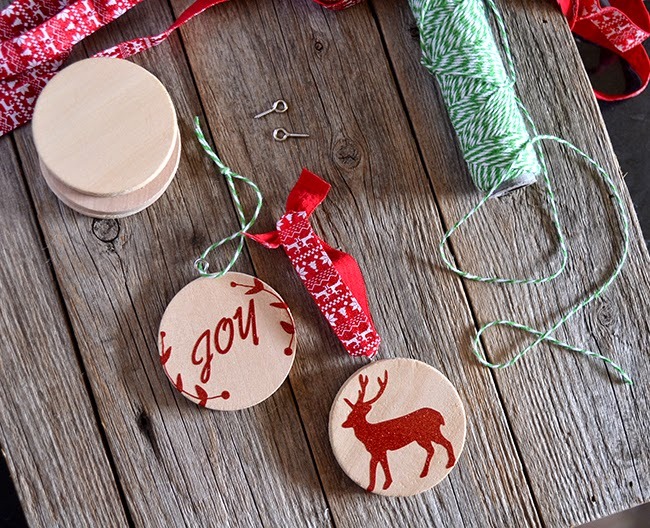 Have been looking for quick, inexpensive and cute ornaments to make for craft show. Hope you don't mind if I borrow your wonderful idea. The show is 12/10 so have to get my fanny in gear. Missed show last year as had right shoulder replaced, didn't want to miss the fun this year again. Love your incredible idea, ornaments are great. 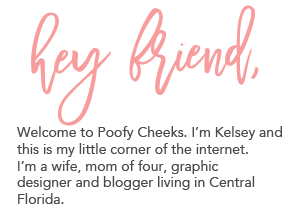 These are so pretty and I love how simple they are! These are so cute! I love the glitter vinyl and the colored string for hanging. 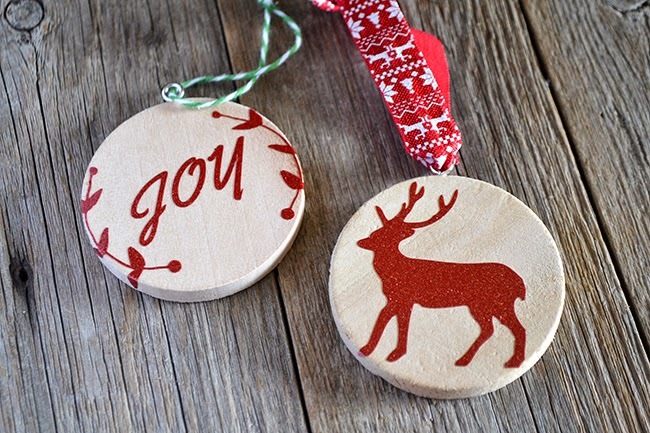 My Christmas decor is a bit on the rustic side, so I especially love these wood ornaments. Great idea to add the red vinyl – looks great! These are super cute! Love that red with the wood. These are so gorgeous! I love the combination of the wood and vinyl.